That promotion you've been waiting for may not just happen. You might have to work for it proactively. Then you may need to ask for it, diplomatically. And then, gracefully, you will accept it. Here's how. Before you get to take the next step on the career ladder, you have to prove that you've excelled at the one you're on. Before you seek a promotion, make sure you can say all of the following things about your current performance. You're doing a great job. The way in which you perform in your current position is going to be key when you're considered for a promotion. Excellent performance reviews and your reputation as an above-average employee carry weight. Make sure you establish concrete performance objectives with your supervisor. If your boss is not inclined to specify goals with you, then compile a draft of goals and ask your supervisor to approve them. Whenever possible, identify objectives that are well-aligned with departmental priorities and any of your supervisor’s projects. Provide written notes (email is fine) on a regular basis to your boss on your progress toward performance objectives, whether requested or not. You're a team player. Volunteer to help with new projects. Serve on committees or task forces. Offer to help your boss and coworkers whenever time permits. When there is a crisis or time of peak demand in your department, put in the extra effort to address the issue. You'll be known as a team player and someone that colleagues want to work with. Align yourself with colleagues who are viewed positively by management and avoid association with malcontents. You don't miss work. Be on time and don't take more days off than you are allocated. If you're known as a sloucher it will be held against you. You network effectively. Attend company parties and gatherings. The more connected and engaged you are with your colleagues, the more you'll stand out when it comes time to consider you for promotion. Try to develop a personal relationship with your supervisor. Managers are more likely to promote an employee they know well than an unknown applicant. You're upping your skills. If your company offers opportunities for professional development classes, take as many as you can. If your skills need updating or advancing, take continuing education or college classes. Pursue any certifications in your field that will enhance your marketability. Your employer may recognize your star qualities and offer you a promotion. Or not. If everyone is thrilled with your performance in your current job, you might have to make them aware that you're ready and eager to take on the next step. Talk with your boss about opportunities for promotion within the department, if that appears to be an option. If there's no opportunity for advancement within your department, look for an opportunity elsewhere in the company. Always let your boss know that you are interviewing for a new position. You don't want the boss to get the news from a human resources person or from the manager of another department. Let her know that you appreciate her mentoring to this point and would like her support in the next phase of your career. You can lay the groundwork for this by discussing your career plans and aspirations as part of your performance reviews. Try to set the tone that you are in this together. Most large companies and many smaller companies list job openings on the company website. Some positions may be open to internal candidates prior to being available to external applicants, so you'll have a jump on the competition. Check regularly for new listings and apply for jobs that are a good fit for your background and experience. As an internal candidate you may have an edge, but that doesn't mean the job is in the bag. Take the time to update your resume and write a targeted cover letter for the job, just as you would for an outside company. Follow the application process - if there is one - for internal job postings. Get references, too. A letter of recommendation for a promotion from your current supervisor (or another manager you've worked with) will carry a lot of weight. Now all you have to do is ace the job promotion interview and send a thank you email message to everyone you interviewed with, reiterating your interest in the position. 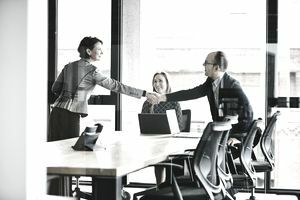 If all goes well and you're offered the promotion, take the time to say goodbye to your current coworkers and to let them know you'll stay in touch. Be sure you wait until the company formally announces your promotion to make your graceful exit.